From aluminum body construction to turbocharged power, Ford's 2015 F-150 pushes the state of the art for pickups. This is the truck everyone's watching—and will likely be chasing in the near future. Because it’s been the best-selling vehicle in North America for almost 40 years, the Ford F-150 is virtually synonymous with the phrase “pickup truck.” It’s been so popular for so long because it’s America’s vehicle for both work and play, plus family duty, and it’s a fixture in business fleets, too. It helps that the F-150 is more highly configurable than any car. The 2015 Ford F-150 is all-new. It takes its crisp looks from the Ford Atlas show car, and it’s a broad-shouldered form that’s both classic F-150 and completely modern. I didn’t run across anyone who thought the looks were anything but good, though there were some who thought the new styling isn’t bold enough. One thing’s for sure, it looks like a Ford pickup, and with a sales dynasty like the F-150’s, that’s no bad thing. A new frame uses lots of high-strength steel, and the body is built from aluminum alloy and houses an interior that’s equally new. The aluminum body keeps weight down, and the EcoBoost engines are the gems of a powertrain lineup that spans from a 3.5-liter naturally aspirated V6 to a robust 5.0-liter V8. 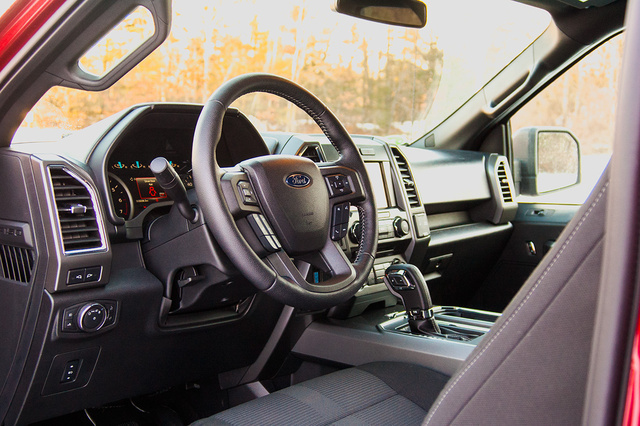 Because its roles are so varied, the F-150 comes in several cab and bed configurations. The truck I drove for a week was an XLT-trim SuperCrew 4x4 with the FX4 suspension package and a 5.5-foot box. That decodes to a middle-trim F-150 with 4 full doors and the shortest bed available atop a 145-inch wheelbase. There’s also the 2-door regular cab and the SuperCab with clamshell-style rear doors. Box lengths vary from 5.5 to 6.5 feet and top out at 8 feet. Available wheelbases are 122.4 or 141 inches for regular cabs, 145 or 163.7 inches for SuperCabs, and 145 or 156.8 inches for the SuperCrew models. Trims for the F-150 are the XL, XLT, Lariat, King Ranch, and Platinum. Base MSRPs range from $25,420 to $50,960. The truck I drove carried the 3.5-liter Ecoboost V6 and a 6-speed automatic transmission, an exceptional powertrain. I didn’t miss a V8 at all, because the Ecoboost torque comes on quick and sticks around. At 420 lb-ft, there’s a lot of it, too—you’d have to get a SuperDuty with the 6.7-liter Power Stroke diesel to get more. The F-150 engine lineup goes like this: 3.5-liter naturally aspirated V6 with 282 hp and 253 lb-ft, 2.7-liter EcoBoost V6 with 325 hp and 375 lb-ft, 3.5-liter EcoBoost V6 with 365 hp and 420 lb-ft, or the 5.0-liter naturally aspirated V8 with 385 hp and 387 lb-ft of torque. The 3.5-liter EcoBoost is very powerful, though there’s occasionally some turbo lag you have to wait through. You’re never waiting very long, and I was impressed when the truck broke traction on some highway merges—probably due to a combination of factors, but a demonstration of muscle, nonetheless. This is a great engine for anything you throw at it, and the turbochargers mean you’re not paying a fuel-economy penalty for performance when you don’t need it. Active grille shutters are standard with EcoBoost engines, as well. The 6-speed automatic can be slow to downshift, but the transmission feels well matched to the engine. I wonder how many buyers will truly need the big muscle provided by the 3.5-liter EcoBoost. The 2.7-liter EcoBoost is stronger than even big V8s were not too long ago, and the naturally aspirated 3.5-liter V6 is no slouch for a standard light-duty pickup engine. There’s a wealth of performance within the F-150 range, though the 16.5 mpg combined I observed for my time was stiffer than I expected. At least it requires only regular fuel, but it seems somewhat disconnected from its EPA fuel-economy figures of 17 mpg city/23 highway/19 combined. To be fair, it was frigid and snowy in New England during my time with the F-150 (which hurts fuel economy), my routes included a fair amount of stop-and-go, and remote start use also probably dinged my mileage. 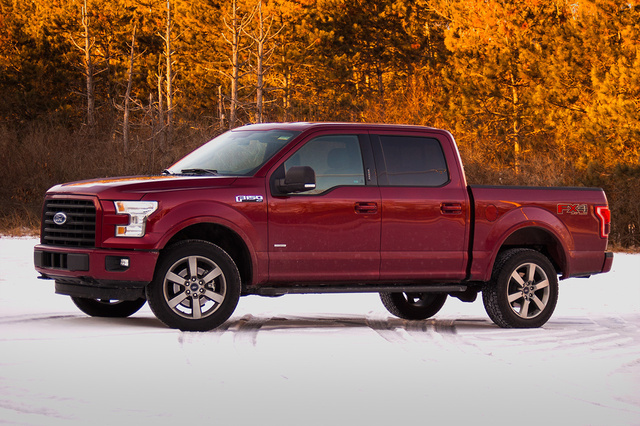 The driving experience is more than just the engine, though, and the 2015 F-150 is refined and well-behaved. The steering is electrically assisted with good weight and responsiveness. There’s very little feedback from the steering, but this is a pickup truck we’re talking about. More importantly, the controls feel solid. There’s very little shaking from the steering column, even over rough terrain, there’s little slack in the brakes, and the ride has been carefully tuned. Road noise is low, and the steel frame underneath it all is solid. There’s virtually none of the quivering you’d expect from a pickup, and the suspension soaks up bumps instead of being overly rigid. 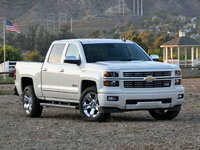 The well-controlled ride is even more a surprise when you consider that I drove a truck with the FX4 off-road package. It includes shock absorbers that are tuned to cope with off-road usage; skid plates for the fuel tank, front differential and transfer case; a 3.31:1 electronic locking rear differential; and Hill Descent Control to control speed when descending grades. The traction advantage of the locking differential was a great ally in the snow. For the last 40 years, every time there’s a brand-new version of a pickup, it’s been called car-like. Trucks have been getting ever more refined for at least two generations, and the 2015 F-150 is an extension of that tradition. Inside the cabin it’s quiet, spacious, and comfortable. 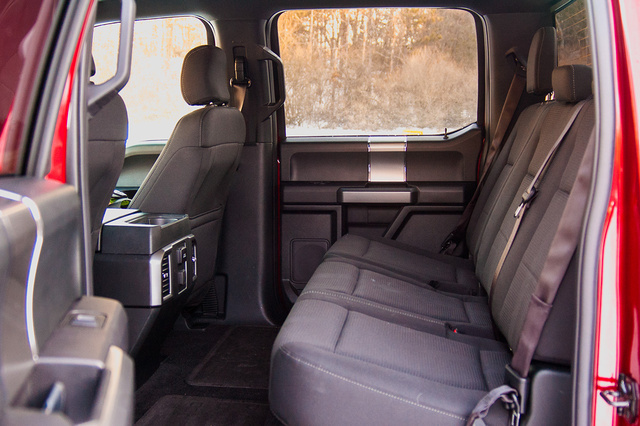 There’s huge space in the cab, especially for second-row passengers. The seats back there fold up as well, leaving a big expanse of flat floor, which can be handy when you need to carry equipment or cargo and keep it out of the weather. The design of the interior is a lot more modern than the truck it replaces, and I found lots of storage space for things like files and even laptop computers in the large center console, which is an optional front-seat configuration. More storage space is carved out of the doors, and there’s a convenient tray atop the dashboard, as well. The standard SuperCrew interior features a front bench seat and column shifter to increase passenger capacity. Other features I enjoyed were the heated 10-way front seats, adjustable pedals, and tilt/telescoping steering column. It’s a set of features that made it easy to find a comfortable driving position, and the seats remained supportive and comfortable for long stretches behind the wheel. Too many small buttons sit too close together on the center stack, which makes it very difficult to operate the secondary controls with gloves on, but there are two knobs for audio volume and tuning, plus a pair for driver and passenger climate controls. The simpler controls of the less-well-equipped models are easier to use, because the buttons are larger and you’re not trying to interact with a touchscreen while going down the road. The interior design looks good, but doesn’t necessarily feel good enough to the touch when you consider the $50,000 price tag of my test vehicle. Some of the interior plastics are shiny, others are just obviously inferior to the competition. The hard door panel that makes your elbow ache would be okay in a base-level XL but feels out of place in a vehicle this expensive. The accent trim looks nice and feels high-quality, as does the cloth upholstery on the seats. Because it’s a pickup truck, the functionality extends to the bed, and Ford has made thoughtful updates. 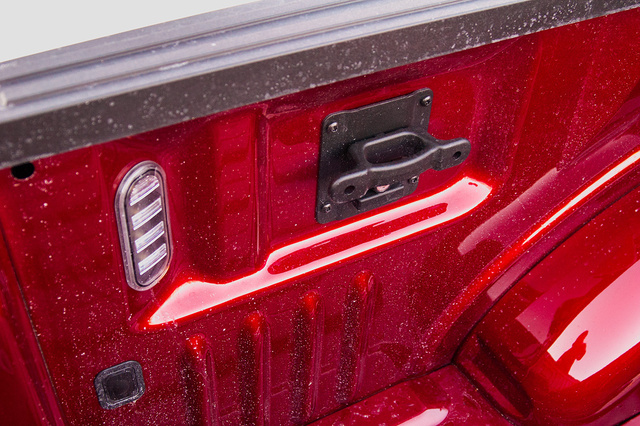 My F-150 was equipped with the latest version of Ford’s tailgate step, which tucks inside the tailgate. It does work, folding out from the top of the tailgate and offering a grab handle, but it’s a triumph of brute-force engineering over something simple like notches cut in the rear bumpers. The tailgate step is a little fiddly, and I wonder what it will do to repair costs should something damage the tailgate. Within the bed, the BoxLink system adds locking cleats that add tie-down points for securing loads. There are also handy D-rings and new LED lighting. Also available are ramps, storage bins, and dividers, depending on what you need from your truck. All of these accessories are available from the aftermarket, but it’s nice to be able to get stuff that’s designed to fit your exact truck, right from the dealer. It also helps make the most of the shorter 5.5-foot bed, which, while useful, limits utility more than you might think. The shorter bed helps keep the total length of the truck down, though, which makes it easier to navigate tight situations like crowded parking lots. 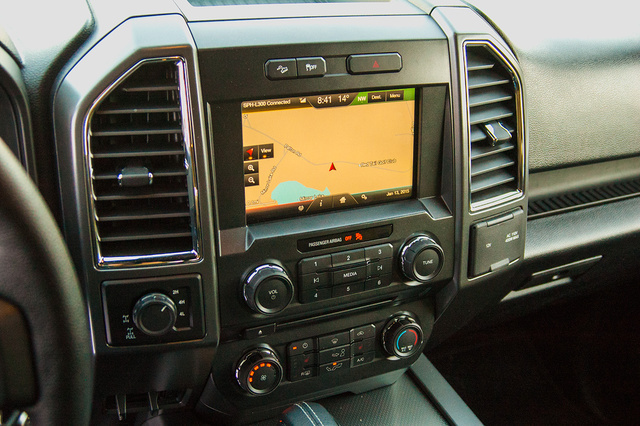 The available MyFordTouch in my XLT truck included Navigation and Sync hands-free features like audible text messaging, voice control for music, and hands-free calling. The Sync functionality is likely to be used frequently, so having it available separately from MyFordTouch is good. Not every buyer is going to want, or need, the 8-inch touchscreen to interface with audio, climate, phone, and navigation. The system does offer a lot of increased capability and includes a 5-year trial of SiriusXM Traffic and Travel Link, but there are many smartphone alternatives. MyFordTouch is hard to use, because the screen icons are small and, as good as the ride is, it’s hard to accurately select what you want while driving. Other technology features are more innovative and successful. There’s an available integrated trailer brake controller, adaptive cruise control, a lane-keeping system, Curve Control, a Blind-Spot Information System with cross-traffic alert, a 360-degree camera system to ease maneuvering, a trailer hitch assist to help you line up without needing a spotter, and even a remote tailgate. My truck featured a powerful inverter supplying 110 volts to outlets in the cab with enough current to support 400 watts of load for charging batteries or running corded tools. Active Park Assist uses a pair of ultrasonic sensors and integrates the electric power-assisted steering to help drivers find a parking spot and then automatically steer the truck into the space. The F-150 requires the care that comes from being behind the wheel of 5,000-plus pounds of vehicle. It’s well-equipped with active and passive safety technology. First and foremost, the controls are responsive without confusing or non-linear behavior. Some exclusive safety technologies are available, too, like the inflatable rear seatbelts in the SuperCrew model I drove. The smart trailer tow module can sense problems with trailer lights or issues with the trailer’s battery or connection to the vehicle. Curve Control is there to help you if you take a corner too quickly. It automatically reduces engine torque and applies the brakes to reduce speed and maintain control. The Blind-Spot Information System’s sensors are tucked into the taillight housings, and it keeps an eye on what's behind when you’re on the highway while also keeping an electronic eye out for crossing traffic when you’re backing out of driveways or parking spots. The Lane-Keeping system uses a camera mounted behind the rear-view mirror to detect markings on the road and vibrate the steering wheel to alert the driver if the vehicle starts to drift, going so far as to apply some steering torque to help guide the vehicle. It’s a pretty impressive suite of technology, and with a vehicle as tall and long as a SuperCrew F-150, the cameras and sensors are immediate helps to even the most experienced drivers. While the price of an F-150 can climb to impressive heights far above $50,000, its base MSRP of $25,420 is one of the lowest. Only Ram is less expensive to start, and only by $10. There’s such a range of configurations, options, equipment, and powertrains to choose from with any competitive modern full-size pickup that the price spread can shock you. The F-150 is full of innovation, from its aluminum-alloy bodywork to the handy functional accessories in the bed and the tech in the cab. It’s light on its feet and feels well put together. 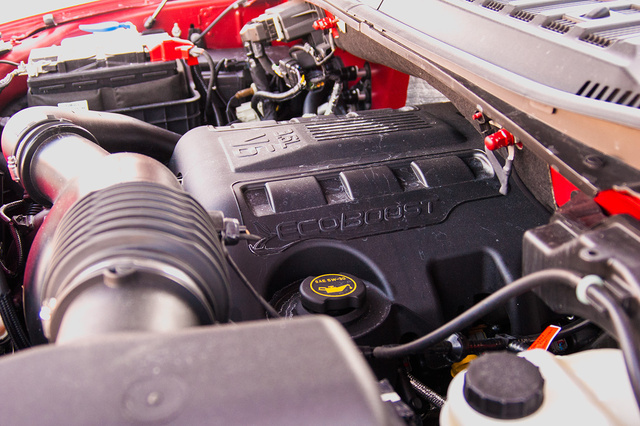 The EcoBoost powertrains have proven themselves in all sorts of Ford vehicles, including the outgoing F-150, and they have the potential to deliver superior fuel economy. Turbochargers, direct injection, and active grille shutters are new levels of sophistication and may require maintenance and repair in the future, but it’s too early to get an accurate read on their long-term durability. The EcoBoost engines themselves have been tortured in testing by Ford and proven exceptionally reliable. Modern turbochargers can go for many hundreds of thousands of miles without a whimper, so the maintenance future for the 2015 F-150 looks good in the crystal ball. Ford’s SD-card based navigation can be easily updated, as can MyFordTouch via a thumbdrive. Among a pickup truck field crowded with competence, the F-150 does everything well. It’s the best mix of capability, efficiency, and features in the class. Resale will hinge on how the truck is equipped to begin with, how it’s treated, and what kind of use it gets. The flip side of being the best-selling vehicle in North America for nearly 40 years is easy availability on the used market. It’s not hard to find a pre-owned Ford pickup, and because of the innovation in this new generation of F-150, the first couple years of the run may be approached warily. The cost to repair the alloy bodywork is one of the larger open questions at the moment, but Ford has done an incredible amount of homework in introducing and supporting the 2015 F-150, so it’s highly likely to set the trends that everyone else winds up following in their next redesigns. What's your take on the 2015 Ford F-150? Terry I have a 2016 f150 xlt 4x4 fairly well optioned out with the new , updated sync3 (it's excellent) . locking diff , tail gate step which is miles better than a notched bumper which makes you lift your leg high , might as well just step on the top of the bumper . My truck has the 3.5 ecoboost , and a host of other options . The armrest on my 2016 is softly padded and comfortable , all in all this is a great great truck and i am happy with my purchase . 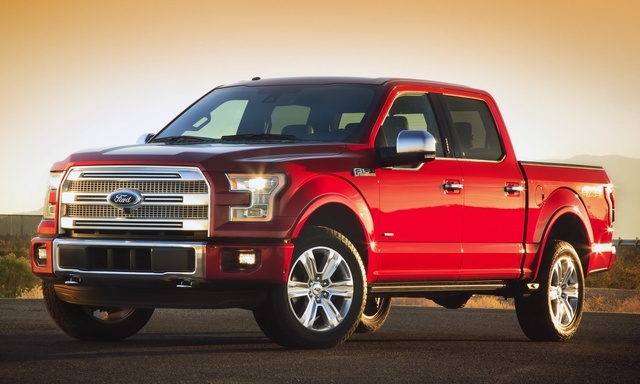 Users ranked 2015 Ford F-150 against other cars which they drove/owned. Each ranking was based on 9 categories. Here is the summary of top rankings. 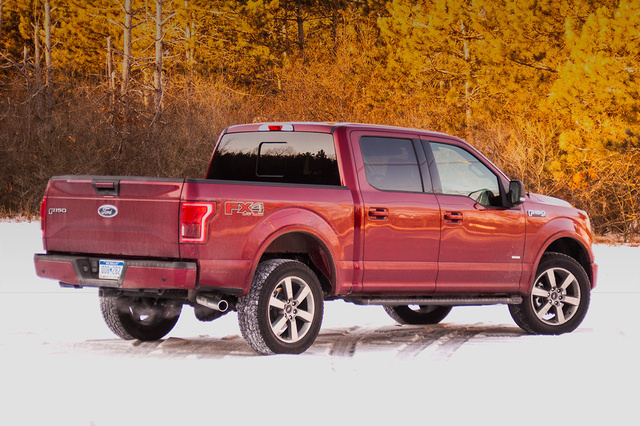 Have you driven a 2015 Ford F-150? I was trying to install a phoenix Android radio on my Ford F- 150. No the whole entire Dash radio and screen won't light up.